Today it is the venue for summer performances – the Film Festival, Opera Season, Equestrian Festival, concerts, … which can seat about 5,000 spectators. 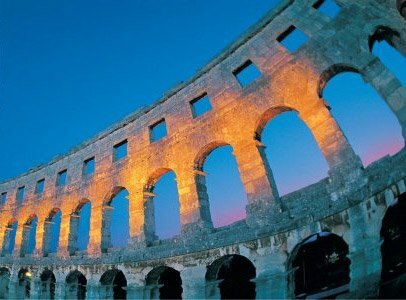 The underground passages, once used by the gladiators, nowadays host a regular exhibition of viticulture and olive growing in Istria in ancient times. The exhibits include reconstructions of machines once used for the production of olive oil and wine (mills, presses, vessels) and amphorae used for storing and transporting olive oil and wine.